Police said that the other IED, parts of which have been recovered, is currently being examined and it is not clear yet whether it was remote controlled or used a timer device. 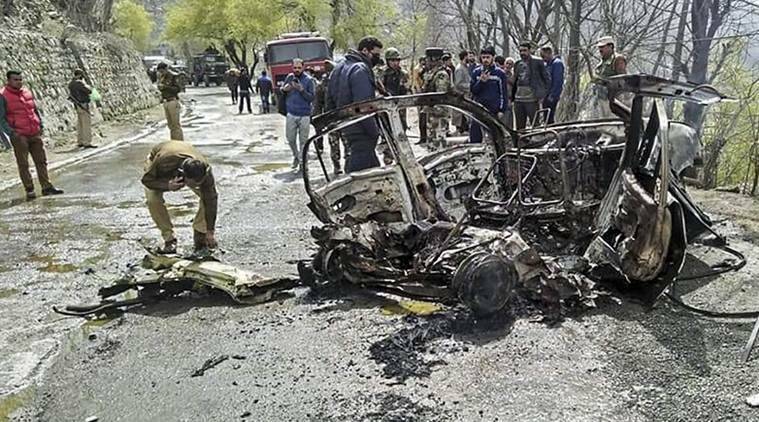 Two days after a car exploded near a CRPF vehicle in Banihal, the Jammu and Kashmir Police Monday arrested Owais Amin (20), who allegedly drove the car, and recovered two improvised explosive devices (IED) of which only one exploded on Saturday. J&K DGP Dilbag Singh said that Amin was arrested around 8.30 pm Sunday while he was trying to return to the Valley. 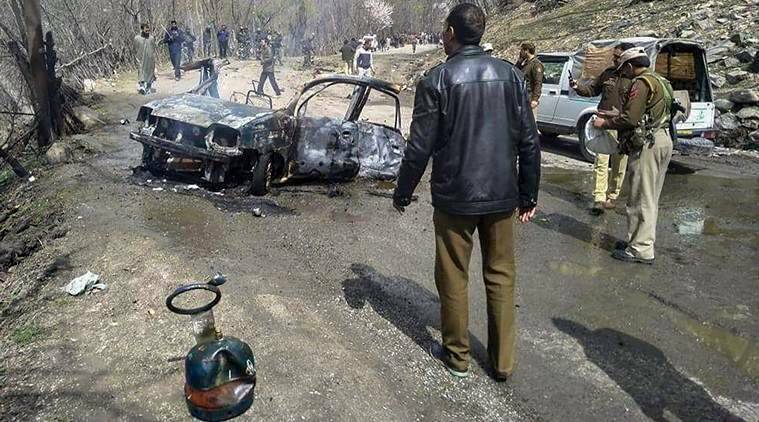 “He had injuries and burn marks when he was apprehended and told us that he was driving the vehicle which exploded near Banihal on Saturday,” he said. According to Singh, “a major tragedy was averted due to the failure in the trigger mechanism of the IED, gelatin sticks and two LPG cylinders”. Sources said Amin is suspected to have been recruited by the Hizbul Mujahideen. Amin, a resident of Vehil, Chatta Waran in Shopian, sources said, was produced before a court in Banihal Monday and was remanded to police custody until April 8. He was arrested on charges of murder, conspiracy and under the Unlawful Activities (Prevention) Act (UAPA), said Singh. On Saturday, the car Amin was allegedly driving hit a CRPF bus and then burst into flames. An explosion occurred inside the vehicle a little later giving the driver enough time to flee the vehicle. Except for slight damage to the rear of the bus, there were no injuries among CRPF personnel. Though the car was completely charred, police have been able to find clues that suggest an attempt to repeat the February 14 Pulwama attack when 40 CRPF men were killed when a suicide bomber rammed his vehicle into a bus. According to Singh, police have recovered “different types of explosives and inflammable substances including more than 50 gelatine sticks (Super Power 90), urea, sulphur, ammonium nitrate, two bottles of petrol and two LPG cylinders’’. “To amplify the effect, the bomber kept two LPG cylinders, one of five litres, the other of 25 litres. The smaller one exploded, perhaps, after the first IED went off and cause a fire,” an investigator involved with the probe said. Asked about lapses in following Home Ministry advisories on the movement of security forces along the highway after the Pulwama attack, Singh said that SOPs have been implemented to the best possible extent, but there are still grey areas which need to be looked into further.